Using a new system called the Decision Support Tool that Army Sustainment Command runs out of Rock Island Arsenal, Ill., "for the first time in my career, we can really see ourselves, and so we know where every single piece of equipment in the Army is, whether you are in the active component, the Reserve component or the National Guard. It's never been that way; it's very powerful. " Cost-wise readiness and doing more with less is now the norm. Agencies will be held accountable for delivering capabilities and readiness under real fiscal restraints and will continue to fiercely compete for limited resources. For over 25 years ProModel has been providing custom and out of the box COTS technology to the private and public sector enabling rapid, predictive, Course of Action capability around process and project management challenges. The Global Force Management Data Initiative (GFM DI) mandates the implementation of a capability that provides a dynamic view of the DoD inventory based on Service Force Structure. This enables timely and accurate senior leader decision-making to best assist the Chairman in fulfilling his statutory responsibilities in support of Secretary of Defense Allocation Decisions. The Joint Force Capabilities Catalog (JFCC), resident on the Global Laydown Server (GLS), is a decision support tool that provides Capabilities, Readiness, Availability, and Employment (CRAE) data from Service and DoD authoritative data sources (ADS) to provide meaningful and understandable information to the user. 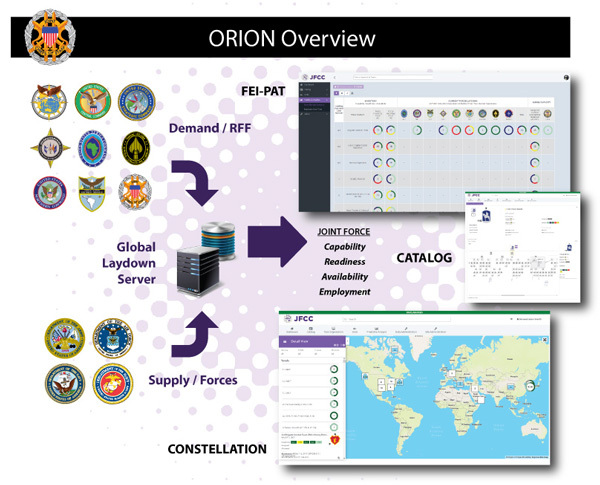 The JFCC Decision Support Tool enables a common view of the Service's force pool in the APEX Enterprise supported by GFM Allocation. Users have the capability to view global force pool baselines, conduct course-of-action experimentation via operational plan impact assessments, capture and measure comprehensive readiness impacts based upon distribution and redistribution of forces and materiel, and conduct predictive analysis assessments of changes in force structure. ProModel Corporation was chosen to design, develop, and deliver the JFCC and GLS based upon our extensive experience in providing decision support capabilities to the Army (Army Force Generation Synchronization Tool) and the Navy (Naval Synchronization Tool). View global force pool baseline - The JFCC/GLS allow users to view the entirety of the service's authorized forces (units, unit hierarchy, attributes, capabilities, readiness, and availability) via an intuitive graphical user interface. Capture Global Demand - The JFCC/GLS allows users to provide the Combatant Commander(s) (CCDRs) with the most appropriate and responsive forces based on stated requirements, balanced against risks [operational, future challenges, force management, institutional] and global priorities. Document Force Commitments - The JFCC/GLS will allow users to identify all force obligations and clearly determine the command relationships as well as coordinate with the Combatant Commander(s) (CCDRs) to initially fulfill mission requirements with Assigned Forces and with forces previously provided through Annual (rotational) Allocation. Track Deployment/Redeployment timelines - The JFCC/GLS provides the user with the capability to capture the movement of forces and its equipment through its rotation into geographic Areas of Responsibility (AOR) that allows the coordination of transportation execution, feasibility analysis, and preposition of materiel. Map deploy/redeploy forces with Geospatial Data - The JFCC/GLS provides the Joint Planning and Execution Community (JPEC) a Force Laydown visualization capability that enables unity of effort and DOD support for visualization of the Force Laydown to establish Lines of Communication and Joint Reception, Staging, Onward Movement and Integration (JRSOI). Meeting the Army's need for its Force Generation processes to sustain global responsiveness and regional engagement while protecting the precious time Soldiers have at home with their families, is a complex challenge. ProModel Corporation was selected to partner with U.S. Army Forces Command (FORSCOM) to develop a toolset that simulates the Total Army moving through the Army Force Generation process and provides the necessary predictive capabilities. The resulting technology developed by this partnership is the Army Force Generation Synchronization Toolset (AST). AST is available on both the SIPR and NIPR Networks to users across the Army worldwide and is the baseline platform supporting the Army's Sustainable Readiness Process. Gather all Army conventional force requirements worldwide in one location and review validated requirements over time. Validate and inspect Army Inventory through a Capability Catalog. Source force requirements with the available Army inventory to fulfill missions based on Global Force Management sourcing guidance. Model units flowing through the Force Generation process with event scheduling capabilities to support synchronizing key events required to optimize unit readiness to meet operational demands placed against the Army. Provide scheduling capability to capture Brigade Combat Teams, required enablers, troop list exceptions, special operations, and non-army participants training at the Combat Training Centers. Develop Known Demand Readiness Objectives (KDROs) in order to analyze the projected readiness level by unit type against contingency demand requirements and to inform budget decisions within the POM Process. Using a new system called the Decision Support Tool that Army Sustainment Command runs out of Rock Island Arsenal, Ill., "for the first time in my career, we can really see ourselves, and so we know where every single piece of equipment in the Army is, whether you are in the active component, the Reserve component or the National Guard. It’s never been that way; it’s very powerful." The Army has an enormous challenge with getting the right equipment (materiel supply) to the right place at the right time (demand). To locate, prepare the equipment and get it to the units to meet requirements, the Secretary of the Army gave Army Materiel Command (AMC) the mission of being the Lead Materiel Integrator (LMI) - the manager of Army materiel distribution/redistribution process. To accomplish the LMI mission, AMC required total asset visibility, visibility of all materiel transactions and the ability to plan into the future. LOGSA created the LMI DST (Lead Materiel Integrator Decision Support Tool) to provide the Materiel Enterprise with this functionality. LMI DST is the unclassified, web-based, collaborative tool the LMI uses to lead the Army Materiel stakeholders through the planning and execution of Army materiel distribution/redistribution. By consuming both legacy and enterprise data, LMI DST provides materiel managers with unprecedented Asset Visibility. LMI DST matches validated, prioritized equipment demands with available Army inventory in depots, units, and other sources. It provides an advanced planning capability to resolve complex scenarios that include force structure changes, modernization of equipment and authorizations and quickly identifying excess in the future. The tool helps equipment managers consider the impact of delivery times and transportation costs and the long-term effects of any decisions. Provide an enterprise view of total Army materiel supply and demand over time. Match validated, prioritized equipment demands with available Army inventory in depots, non- deployed units, and other sources to create proposed sourcing decisions to fill any shortages. Improve overall Army readiness by more effectively Distributing/Redistributing materiel.